Incase you don’t know, Ipsy is a monthly beauty subscription service. It costs $10 a month (and that includes shipping), and you are going to get 5 sample to full sized items. The retail price of these items well surpasses the $10 a month for your subscription. We have yet to have a month, were it was not worth it. Plus, you are going to get a reusable makeup bag each month too. Those come in very handy for everyday things that pop up. What did we get in January’s bag? My thoughts: I am not a huge fan of shimmery eyeshadow, I much prefer matte. However, this is a very pretty color. It is a pinky, brown, champagne color. And while I was not jumping over the moon about it, my teenage daughter did. And it looks amazing on her. Very pretty, very pigmented. My thoughts: It is a great bronzer, it is a hit for a reason. And there is no weird orange coloring to this at all. Even with my very fair skin, it looks very natural. Get the look of being out in the sun all day without the sun. My thoughts: This was AMAZING!! I am a huge fan of primers. They can take your skin to the next level and really help with staying power for your makeup; if they are good. And this one did not let us down. Plus, I don’t like to wear foundation, and this alone helped shine at bay. Giving my face a wonderful matte look without any heavy foundation. Blush and concealer stayed in place all day too; which is a huge plus. My thoughts: I am so in love with this brand. 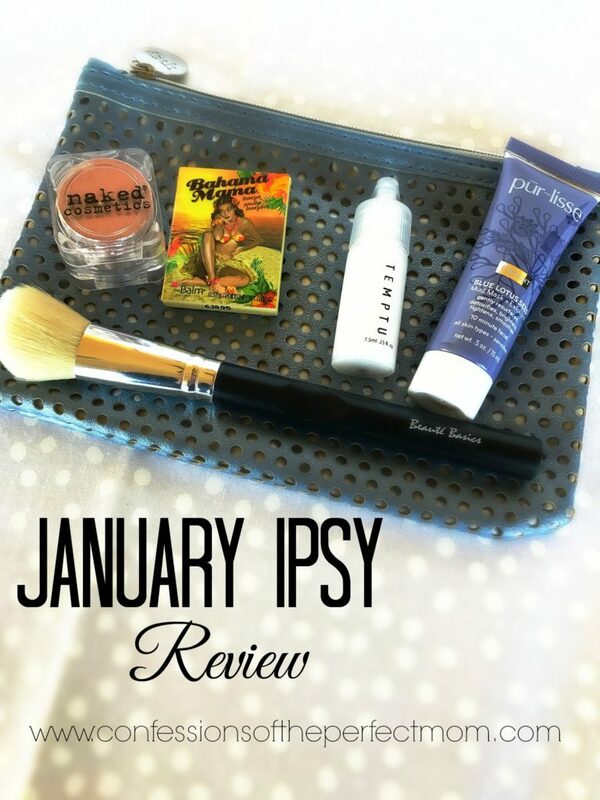 And Ipsy works with them a lot, so we have gotten to try a lot of their products. Not one has let us down, and this certainly didn’t. I love how gentle is it with my.. uhum (silently whispering) aging and sensitive skin. They work amazing, without any harshness or drying. This was such a great little sample. And by little, it will be good for a good 5 uses. My thoughts: I LOVE LOVE LOVE these brushes. I have received a few of their eyeshadow brushes through out my time with Ipsy, and they are so soft, blend amazing, pick up the perfect amount of make up and over all just the perfect brushes. This alone made the entire bag this month. This was a great fun new bag. And I love the silvery polka dots. It is not as big as some of the other bags that we have received. So no way to use this also as a small handbag, or to even hold your brushes. But it is very cute and super useful for nail polishes, bobby pins, hair ties or other small items rolling around in your bathroom drawer. Overall this month was a hit. All of the items were used by either myself or one of my daughters. And well worth the $10 price point. Do any of your guys Ipsy? What would you love to see in one of their bags? What would make you sign up and pay the monthly fee? Let me know your thoughts.